Home / MOVIE REVIEWS / "War Dogs" Movie Review: Comedic, Dramatic, and Explosive! "War Dogs" Movie Review: Comedic, Dramatic, and Explosive! Warner Bros. Pictures' "War Dogs" comedy-drama movie is an explosive and informative film based and inspired on true events. It is very entertaining, funny, witty, and all-original even though we can see some "Hangover" humor in it. Jonah Hill and Miles Teller's on-screen chemistry simply nailed it! "War Dogs" tells about the rags-to-riches lives of two small firearms middlemen broker from the point of view of Miles Teller's character. Miles Teller is a revelation in this movie. We really liked his acting and the way he delivered his lines. But of course, Jonah Hill's perfect comedic timing also gives the story an interesting twist especially when the two confronted each other towards the end of the movie. You'll feel the intense and the gap between the two despite the good chemistry at the beginning part of the film. 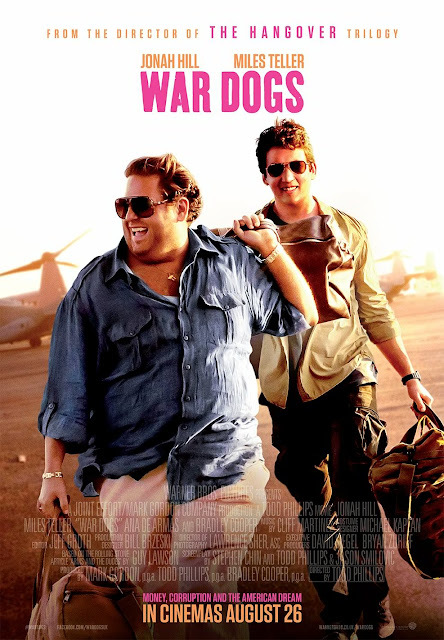 The events in the movie are somewhat "too good to be true", but the fact that the story were told and presented that way it was shown, the movie "War Dogs" has become an icon of its own. It is well-organized, well-presented, and well-researched as well. Overall, "War Dogs" gave us the feels that we need to know the twist and turns of doing transactions with the government and that there is a gold mine in doing so and that everyone should do this with careful steps and this finally interests the public viewing moviegoers. Jonah Hill and Miles Teller, also including the cameo role of Bradley Cooper, simply made a movie with perfect and explosive chemistry of action, wit, drama, and comedy. An 8 out of 10 movie experience!